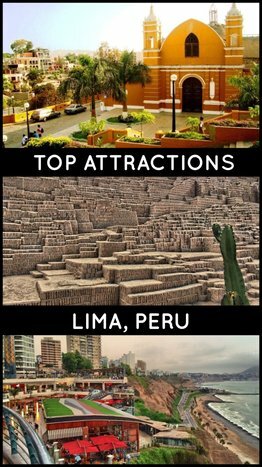 Things to do in Lima are among the last details you plan as your entire trip to Peru comes together. One of the best Lima attractions is undoubtedly the city's food scene, but of course we're biased as we run Lima food tours. Lima is in quite a position of priviledge when looking for things to do is concerned. This South American capital is geographically unique as it is located on the Pacific coast, giving way to breath-taking walks along the coastline, or malecón, and opportunities for adventure by paragliding off the cliffs of Miraflores. Expertly landscaped gardens align the cliffside boardwalk making it a paradisiacal promenade at sunset. There are several notable parks along the stroll, some of the most eye-catching are in the Love Park Lima, showcasing Victor Delfin's iconic statue, The Kiss, or the little stretch that features La Marina Lighthouse. In addition to the unforgettable views, culturally Peru stands out as home to some of the oldest civilizations in the world (Norte Chico from 4,600 years ago) as well as having been the Vicerroyalty and supreme center of affairs of the Spanish crown in the Americas during the conquest and colonization. The impressive relics from the first coastal inhabitants and subsequent residents, ranging from architecture (Huaca Huallamarca or San Francisco Convent) to textile and ceramic patterns (Inca Market), leave Lima with no shortage of things to do and see. Geography and history aside, you can also participate in a chocolate workshop at the Choco Museo or walk through the Guinness Book of World Records's largest water fountain complex at the Magic Water Circuit. Wednesday – Sunday 4:00 pm – 11:00 pm. Monday – Sunday: 11:00 am – 7:30 pm. Workshops: 11:30 am, 2:30 pm, 5:30 pm. Saturday: 10:00 am – 1:00 pm. Monday – Sunday 12:00 hrs.